I haven't had a Caesar salad in...I don't even know how long. I've been craving it. I forgot I was out of gluten-free bread, so I made parmesan chicken 'croutons'. Really, they're just little chicken nuggets with lots of parmesan cheese. This is delicious. Seriously. Sprinkle the chicken thigh pieces with salt and pepper. Combine the cheese and bread crumbs, then beat the egg and milk together. Dip the chicken pieces in the egg, then the cheese-crumb mixture. Heat the oil and fry the chicken pieces until they're cooked. Chop up the romaine hearts and put them in a big salad bowl, then toss with the dressing. Top with the crispy chicken, and serve. Serves 4. The chicken looks so crispy and tasty! Great addition to the salad. Yummy........ Very Tasty.. 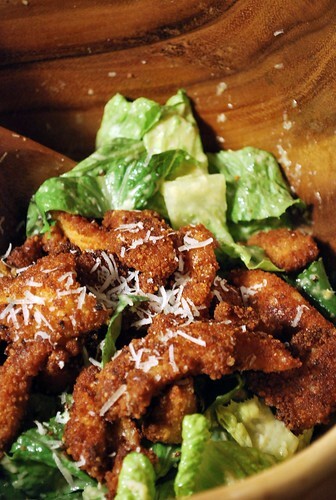 I Love this parmesan chicken croutons. Love the sound of those "croutons"!! I've got something for you over at my blog =D.